Watching a film in a country whose first language is not your own is rarely the obvious choice for spending a few hours of any holiday. The idea was a long while in coming the first time I thought to visit a foreign picture house – but once the energy saving lightbulb above my head had warmed up, it burned bright. December 2012 saw Denmark’s biggest city under siege from an icy wind, the chill from which no blanket of snow could keep out. I slid through the streets in search of the improbably named Vester Vov Vov and, in a cosy screen seemingly hollowed out of the ground, cheerfully rode the emotional rollercoaster of Searching For Sugarman. I’d recommend the film to anyone, but as a Swedish/British co-production about an American musician who became popular in South Africa, it had little to teach me about the country I was in. Still, I didn’t have to worry about the Danish subtitles, and could be grateful that it hadn’t been dubbed instead! How much cultural insight did I want? The cinema foyer had a 35mm projector and a display of the rules of the Dogma 95 movement to admire. I enjoyed a beer, chatted to a German couple who considered Vester Vov Vov to be Copenhagen’s best cinema, and generally revelled in an afternoon more than worthy of a place in my journey around indie cinemas. Two years later the international post took the subsequent book to Denmark. I had zero expectation of it leading to anything – I simply wanted to share the story – but when my phone pinged a week later broadcasting the arrival of new mail, I was greeted by a message not only written with great pride, but with the sort of fluency and good spelling that puts many native English speakers to shame. It thanked me for sending two books, as it meant that Peter and Torben – the brothers who opened Vester Vov Vov in 1975 and still operate it today – would not have to fight over reading it. Peter encouraged me to return to Copenhagen in the summer when the weather would be better and the outdoor terrace across the street would have a cold beer waiting for me. That’s a pretty difficult suggestion to turn down, but the real thrill was connecting with the owners of an indie cinema in a foreign land. I’ll do what I can to get back there this year, and maybe even belie my lack of journalistic experience by asking to interview two brothers who’ve been in business for four decades. They must have some real Danish stories. One week after receiving Peter’s email, Eurostar was carrying me to Belgium’s capital for a work trip. Full time employment pays for weekends to destinations like Copenhagen, but it also uses time and energy that could otherwise make a go of writing full time. Heading to Brussels was a ‘best of both worlds’ scenario – my reward for attending a training course at 9am sharp the next morning was an evening to spend as I pleased. 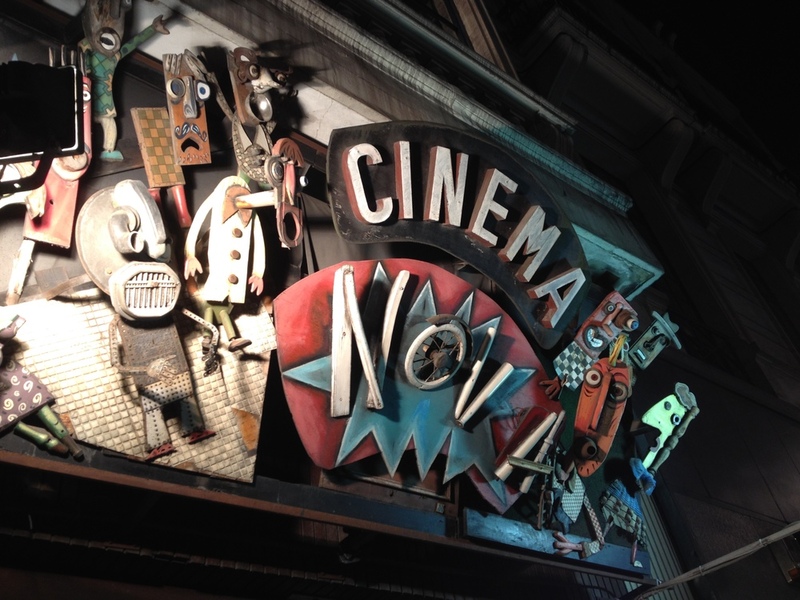 With the memory of Vester Vov Vov so recently reawakened, I’d wasted no time searching for cinémas aux Bruxelles. …the downside being that it was all in French. The only meaningful thing I can do with the language of France is ask for a vanilla ice cream, so understanding heated political debate was never on the cards. I fired off an email to the Nova’s contact address asking if I stood a chance of getting anything out of the evening, and started on a Plan B.
Cinematek is the name of the Royal Belgian Film Archive, and they don’t even stretch to translating their website into English. The timing of my train meant the museum of film would, sadly, be shut by the time I arrived, but the evening nevertheless offered a full schedule of five films to pick from. Of immediate interest was 1974’s A Woman Under the Influence, starring Peter Falk and screening as part of a special season. The prospect of an English language film was enticing, especially as it had worked out so well in Denmark. Defaulting to the easy route, though, nearly led me to miss a far more interesting option. After all, why let language be an issue at all? On the eve of the trip, my phone pinged again. A reply from the Nova (also written in perfect English) offered a very honest assessment of how little I’d probably get out of the film and discussion. Not that that had to matter: come along, the email invited, it promises to be an interesting experience, and if it all gets too much then chill out in the bar with a drink. And if you’re around earlier in the day, the email continued, I can squeeze in a quick tour for you. This was amazing stuff, and a particularly generous offer. Alas, the timings didn’t work and – as with visiting Cinematek’s museum – the perils of trying to cram personal projects into a work trip reared their ugly head again. With regret, I tapped out a reply that said I’d have to miss out on this occasion, but that I would engineer another visit to the city and ensure I had time to accept such kind hospitality. What was it about these small cinemas in other nations’ capitals that had made them such friendly enterprises? I’ve had positive dealings with a number of UK cinemas, but few have been so immediately enthusiastic as to make unbidden offers of tours and beers on a terrace. Did I rescue this entire episode by at least making it to Cinematek? Shamefully, I must admit that I didn’t. I told you there was potential for anti-climax! When faced with catching a train back to your Brussels suburb at nearly midnight, and when a colleague attending the same training course says he’ll buy you steak and frites for dinner, unfortunately priorities readjust. I needed food more than the film. Too many cinema visits risk degenerating into nothing more than rushing in, sitting down for a few hours and rushing back out again. I loved the idea of seeing Dr Caligari, but without the time to savour the full extent of the Film Archive, how satisfying would a diluted visit have been? I’m fortunate that a paid-for Eurostar trip proved how accessible Brussels’ indies are, but dashing about at two hundred miles per hour and cramming in brief glimpses of these magnificent buildings felt like a work/life balance that resembled a fraying tightrope. What my interactions with Vester Vov Vov and the Nova had proved is that small arthouse cinemas are rewarding work for the friendly people who run them. And that work can last a lifetime, which is something to be inspired by whether you catch a film there or not.